AVerTV Volar GO ~ " World Information "
(PAL/SECAM/NTSC) and FM radio broadcasting programs with worldwide TV stereo sound support. 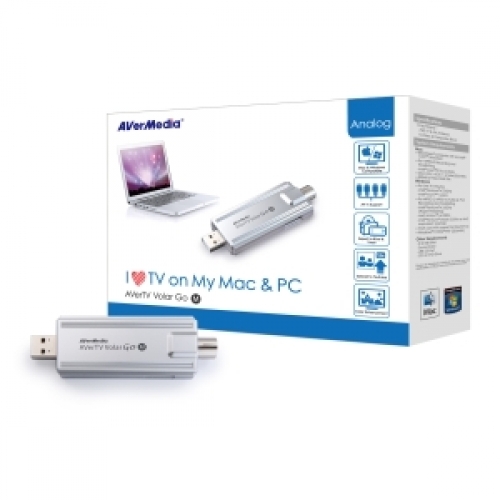 Thanks for the latest AVerMedia software program and licensed MCE software encoder, which highlights the attractiveness of this product to be capable of supporting real-time H.264 recording format up to resolution of 320X240 iPod/PSP Video format recording and to be run on XP / Vista MCE platforms. Now, the AVerTV Volar GO leads you into a pleasant TV viewing world. Watching TV on PC is a joy because the AVerTV Volar GO comes with an ease-of-use remote control, allowing users to take more complete control over their TV viewing entertainment. Moreover, it will enrich your user experience with the included S-Video / Composite 2 in 1 cable which can connect your laptop with DVD/VHS player, camcorder, or game console. This complete but cost-effective package provides the ultimate in flexibility to meet your multimedia needs. With just one USB connection; users can experience PC-TV entertainment simply, on any laptop or desktop computer whenever they want, wherever they like. 2009 by AVERMEDIA TECHNOLOGIES, Inc. All right reserved. AVerMedia is registered trademarks of AVerMedia Technologies, Inc. All other trademarks belong to their respective companies.